Good idea, sirji. 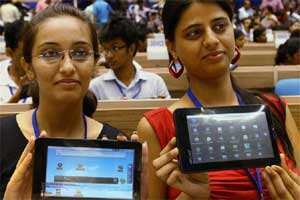 2G, 3G and now no G. Last week, Union human resource development minister Kapil Sibal released Akash, India’s boy wonder tablet. The low-cost device, designed for schoolchildren, connects to the Internet via Wi-Fi. Non-existent Wi-Fi, that is. While Akash takes to the sky, the engine to power it, Wi-Fi interconnectivity, remains sorely lacking. Forget Wi-Fi, most bastis and government schools don’t have dial-up connectivity. Will Sibal, as the minister of communications and information technology as well as the minister of human resource development, help the poor leapfrog into the 21st century, create Wi-Fi hot spots in a few densely populated areas in the country? Take a few such areas, Old Delhi, Dharavi in Mumbai, Charminar in Hyderabad, and see what happens. Let the Internet roam free. Wi-Fi hot spots have been created in various cities across the world. In New York City, a developer has installed free Wi-Fi in the Dumbo area (Dumbo is an ironically named hip area of Brooklyn). Other cities across the US and Europe have installed Wi-Fi hot spots. However, the need in those countries is more limited, as the Internet is available through a multitude of channels. In India, for most, the Internet is not available at all. So what could happen with free Wi-Fi? A lot. Mobile financial services could become more robust. Kenya has been leading the way with its M-Pesa service, where more than 70% of adults have a bank-like account using their mobile phones. Minutes are used as a medium of currency. But a more robust system would be actual bank accounts, earning interest. Wi-Fi-enabled phones might make that possible. Health outcomes can be improved. A recent story in Forbes reported a mobile health initiative helping people stop smoking. In this case, an SMS was sent as a reminder to people not to smoke. Double the number of people receiving the SMS quit as those not receiving the SMS. Imagine what Wi-Fi could do? YouTube videos on hygiene, disease prevention, the importance of vaccinations could help improve health outcomes. Perhaps the most electrifying usage would be to marry Akash (or more likely Akash II, a better and more stable version) with Wi-Fi. The Internet meme of last week was that of a one-year-old child trying to use a magazine as an iPad. The one-year-old had mastered (or at least was proficient) at using the iPad and when given a magazine tried to swipe it. Eventually, the child became frustrated, throwing the magazine away. Children are early adopters and nowhere have we seen this as much as than with the iPad, Akash’s big brother. As anyone who has seen a child play with an iPad knows, they take to it like a fish to water. In The New York Times, a local principal of a school that has adopted the iPad said, “I think this could very well be the biggest thing to hit school technology." Even without an Akash or iPad, Wi-Fi could be a game-changer for Indian children. The new draft telecom policy released this month says that broadband should be a right; the Union government is “to make efforts to recognize telecom and broadband connectivity as a basic necessity like education and health and work towards the ‘right to broadband’". The plans are audacious: 175 million broadband connections by 2015 at 2 mpbs speed and 600 million by 2020. How about a smaller start? The government is great at establishing stretched goals that will not be met. Just Wi-Fi a few areas and see the difference. Or Wi-Fi all government schools. As many are saying now, India’s demographic dividend is a potential ticking time bomb; familiarity with the Internet is a must for any 21st century worker. Fifteen million children will come of age each year between now and 2020. That’s over 200 million students who will enter the workforce by 2020. Few government schools have the Internet today (many don’t even have basic facilities, but again a different story). Blanket all government schools in a cloud of Wi-Fi. Who better to do that than the minister-in-charge of both education and communications? What better way to forget 2G and 3G than leaving a legacy of Wi-Fi-enabled schools! Wi-Fi is not a panacea, but it is an enabler. We have moved from roti, kapda aur makan to roti, kapda, makan aur mobile. It’s time to move to roti, kapda, makan, mobile aur Wi-Fi. Prashant Agrawal, a principal at a management consultancy, writes on public policy issues in India and internationally.